Entrepreneur First (EF), a pioneering UK based global talent investor, announced its launch in India; and the appointment of Esha Tiwary as General Manager. 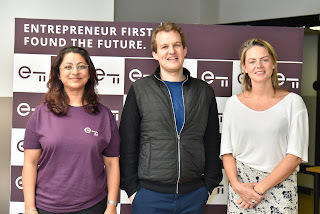 EF also announced its first-ever cohort of 50 founders in Bangalore, its sixth global location. Entrepreneur First has a first-of-its-kind program model that invests in outstanding individuals, even before they have an idea and helps them find co-founders and raise seed funding. This model has been running successfully in 5 locations around the world - London, Paris, Berlin, Hong Kong and Singapore. As part of its pledge, EF will invest in each of the companies developed during its bi-annual Bangalore programme that clear the Investment Committee. They will also pay each of the selected cohort members a monthly stipend during their process of developing startup ideas in the first three months. EF focuses on deep tech companies that build on defensible technologies such as Artificial Intelligence, Quantum Computing, AR/VR, Robotics etc and in the past has funded companies across a broad spectrum of industries including space, satellites, medical devices, logistics, marine technologies, insurance, banking, fintech, education, agriculture and many more. Finalized startups from EF Bangalore will pitch to well-recognized regional and global investors at Investor Demo Day in Asia next July. Also present on the Investor Demo Day will be startup counterparts from EF’s Hong Kong and Singapore programmes.